IDS Live, Online Dream Groups are intentionally kept small enough so you receive individual guidance on your dreams in every session, and so participants form meaningful connections with one another. Professional facilitation and leadership by dream experts Justina Lasley and Tzivia Gover helps to create a safe, welcoming, and productive environment where each member can gain deep wisdom and insight from their dreams. Are you ready to receive the wisdom and guidance of your dreams? For new and returning IDS group members. In this interactive online workshop, participants will learn the basics of dreamwork, have the opportunity to work on one of their dreams, and experience group dreamwork. New to IDS? This workshop is ideal for NEW IDS group members–and offers a welcoming environment for returning members, too! Participants who take this workshop (or any other IDS class or workshop) are eligible to take any of the workshops for returning students listed below! In this workshop participants will look at the structures in their dreams: Houses with extra rooms or rickety staircases, luxurious castles, or broken down shacks: The architecture in our dreams can reveal a lot about the structure of our personal lives. This workshop is open to anyone who has taken an IDS class or group with Tzivia or Justina, including the May 1, “Dreamwork 101” workshop. In this workshop we’ll look at how to approach scary dreams, including nightmares, to find the healing message in even our most disturbing dreams. Participants will be given strategies to create feelings of safety when approaching scary dreams, so that they can investigate the dreams’ meaning and messages. This workshop is open to anyone who has taken an IDS class or group with Tzivia or Justina, including the “Dreamwork 101” workshop. Enjoy the creativity and wisdom of your dreaming mind. 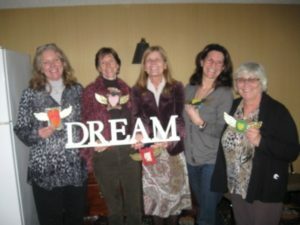 Join an Institute for Dream Studies’ Online Dream Group, and give yourself the gift of meaning. Explore your dreams with a community of dreamers from around the world. Continuing Education Credits available: You must inform us at least 2 weeks prior to the enrollment date if you would like to receive CE Credits. $49 per workshop, or register for all 3 for $135 and SAVE. Click here to access the pricing page and checkout! Make your professional dreams come true. Join Institute for Dream Studies founder Justina Lasley and director Tzivia Gover for “The Professional Dreamer: Boosting your business with Dreams and Dreamwork,” A hands-on mini course. About one week before the workshop date you will receive your log-on instructions and other pertinent information. Space is limited so enroll today.